When Tuvshinbayar damaged his knee at the 2012 London Olympics I was sad, but I admired how he still competed for the gold, despite having very little chance, and risking long term injury. He had won gold in 2008, but I think that moment in 2012 was more significant to me. At that time it made me proud to be in Mongolia, to realize that Mongolians could match it with the best in the world. But it also reminded me how fickle life can be. Gold medals have to be earned in all contests, and especially the final contest. Despite serious injury to his leg, he fought proudly in the final against Tagir Khaibulaev of Russia to defend his Olympic champion title. 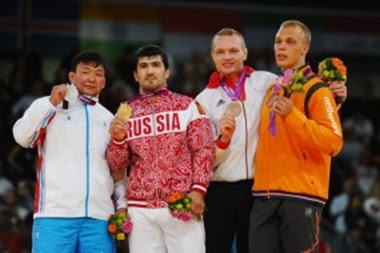 He won silver in the men’s heavyweight 100 kg category last Thursday and became a national hero. Six years later Tuvshinbayar is still making his contribution to sport. But he knows his physical abilities will decline and he has also made the move into being a businessman. He is smart, and he realizes that his reputation is a huge asset to leverage for his family’s future wellbeing. Tuvshinbayar comes from humble origin and has enjoyed the backing and support of a united Mongolian Judo Association. Tuvshinbayar realizes he is not a god and has to survive in a tough world post judo. He is being smart about this, he is being respectful to those who have applauded him, thankful to those who have rewarded him and to those who have emotionally adopted him in as one of their own. I am not Mongolian, but I am marrying a Mongolian in June, I have 3 Mongolian children, we live in Ulaanbaatar and my business is based in Mongolia. We do not flee Mongolia in the winter and we share and suffer the pollution with those who reside in UB and the bigger Aimag centers. I am deeply committed to seeing Mongolia be as successful as possible. And it appears clear to me that the limitations placed on Mongolia’s improvement in living standards are not imposed by being landlocked, nor by international organizations that work with Mongolia’s public and private sector. But I will write more on that soon. People recognize that individuals are not born the same – be that physical or mental ability, personality type or religious inclination. However – regardless of the traits we are born with, our parents always want the best of opportunities for our children. We want them to grow up to be decent individuals, making a positive contribution to their families, community, their employer and their country. Note – I say country and not government, as I believe governments are no better or worse than other big organizations in the world. Some countries are lucky to have strong government institutions while others have institutions that are rot to the core. But back to my personal feelings. My ambitions for my children are no different to that of a herder family in the Gobi desert. Firstly, I want them to grow up healthy, to get the best education possible and to have an international outlook. Of course, I would love them to be sporting champions, or cultural ambassadors – if they were blessed with those talents. And when they finish their formal education I want them to get a high-quality job with a world class organization. Maybe they will become entrepreneurs, and grow their own business – a riskier path, but just as admirable in my humble view. And let us be clear – Mongolia has emerged with a generation of small business entrepreneurs. However, this class needs to be encouraged and given recognition as an honorable sector in our country. And some of these entrepreneurs will be successful and grow larger businesses – hopefully to world class standards – and provide employment opportunities to our family members. And we want these businesses to be profitable so that they pay taxes that are used for providing world class services – through government operated education and health facilities. And it would be fantastic if this all happened much sooner than later – and in Mongolia. But to live and work overseas is also a life-broadening event that should not be passed up, if the opportunity presents itself. And the opportunity is more likely when that person has a great academic record, and some experience with world class organizations. I think we would all like this for our children. My frustration with the pollution in UB is not greater than any other person living in the City. But my tolerance of the excuses made by politicians for the continuation of the world’s worst pollution has totally run out. To me this is a life and death issue – an issue that affects the health of my family for six months a year, and possibly for the rest of their lives. Like all Mongolians I want simple but complicated things for my children – a healthy environment and life, a high- quality education and work opportunities with world class businesses. If they get these I know I have done my job as a parent, and I live and die content. But these things that I want for my children are not broadly available at present, and I ask myself when will these simple things become available. But to answer that question – when? – a few fundamental questions needs to be asked of our political leaders, their parties and the Khural. Firstly, when AND HOW will the government generate more sustainable taxation to establish better services? Secondly, when will we get more world-class businesses established in Mongolia? Thirdly, when will we get more and better paying jobs for our children? Fourthly, will the government continue to insist that it is better at growing and running the business sector than private firms? Fifthly, when will Mongolia finally be free of international rescue packages? Tuvshinbayar is an icon and congratulations to him – and I hope Mongolians are not jealous of his success. Mongolia needs more Tuvshinbayar’s – but in different fields of critical endeavor – that benefit all Mongolians. We need national heroes who will develop our economy, who will set the laws that make Mongolia attractive to international investors and lenders. We need heroes who can strike agreements that bring billions into our economy. But we also need to recognize the heroes in public service – who say no to behavior that will not be respected internationally. We need to recognize the heroes in business who establish world class businesses and bring investment into Mongolia. And we need to name the anti-heroes – those who survive and thrive by criticizing and persecuting the hard work and contributions of those who have actually grown our economy and already improved the lives of many Mongolians. Overall, we need many more national heroes than anti-heroes. And we need all Mongolians to recognize and reward those who deliver economic growth and improved standards of living for all. And let us remember, Tuvshinbayar would never have won his gold and silver medals if he had deliberately flouted the international laws of judo. Cameron came to Mongolia in 2010, and was president of Oyu Tolgoi until October 2013. His company, Tarva Investment and Advisory LLC, provides services to public and private organizations inside Mongolia and internationally. Cameron is Acting Chairman of the Business Council of Mongolia, a Director of the Arts Council of Mongolia and Founding President of the Institute of National Strategy (http://nationalstrategy.mn/).